LONDON - It was 5:15 a.m. when an exhausted Theresa May entered the campaign war room at Tory headquarters to face her demoralized party workers. Surrounded by discarded food wrappers, inflated blue balloons and empty bottles of beer and wine, May addressed the wreckage of a gamble that went from sure thing to catastrophe in less than two months. The loss of her parliamentary majority 10 days before the start of Brexit talks ruined her own prospects and plunged Britain into renewed political chaos. It’s little wonder that the prime minister was said by one campaign official to have been in tears. This article is based on interviews with 15 Conservative ministers, candidates and campaign officials, all of whom declined to be identified discussing confidential party matters. In the meantime, there are more immediate battles to fight. Foes include Tory dissidents who want her out now, a born-again Labour opposition that will confront her at every turn, anti-European hard-liners who will demand she hew to the toughest possible line and the European Union leaders who will seek to make the U.K. divorce as painful as possible. Losing her majority was an outcome she could hardly have imagined seven weeks earlier when she surprised all but her closest advisers by announcing an early election. She told the public she needed their backing to strengthen her position ahead of Brexit negotiations and to silence opposition in Parliament to her plans to leave the EU. Instead, the prime minister is far weaker — facing calls from furious Tories to sack her closest advisers, which she later acquiesced to, and even to quit herself. A year on from the Brexit referendum, Britain’s future place in Europe is once again an open question. For some Conservative lawmakers, who saw their 20-point poll lead over Labour evaporate, May is now little more than a caretaker, holding the fort while a wounded party puts itself back together and finds another leader for whenever the next election comes. That vote, they say, could come within months, if any minority government — likely to be propped up by the Democratic Unionist Party of Northern Ireland — falls apart. Two questions now dominate private discussions among angry ministers and officials: How did they end up in such a mess, and how can they now get out of it. For nine months after she became prime minister, May — who got the job last year through a party selection process following the resignation of David Cameron — consistently ruled out calling an early election. The country needed stability, she said. But two key ministers pushed her to change her mind, according to senior government officials. Chancellor of the Exchequer Philip Hammond prodded the prime minister to go for a snap election, while David Davis, her Brexit secretary, was instrumental in persuading her to call an early vote, five officials said. May finally decided she’d go for it while on a walking holiday with her husband, Philip, in Wales, over the Easter break. She announced her plan to do so on April 18. Davis and Hammond told May that the vote would buy her more time and more leverage to negotiate Brexit. The problem was that under the pre-existing timetable, the talks would climax in 2019 just as the U.K. prepared for an election in 2020, putting intense pressure on May to get a deal she could sell to voters. In the early weeks of the campaign, May’s gamble seemed to be paying off. Her personal ratings were so high she built the whole campaign around her own brand. Vote for “Theresa May and her team,” campaign posters said. Party identification was largely absent. In public, May warned voters against complacency, but privately senior ministers were predicting a majority of 140 in the 650-seat lower chamber. The Tories retained their double-digit leads in the polls, while Jeremy Corbyn’s team made amateurish and basic mistakes on the campaign trail. Then, on May 10, came a break — seemingly in May’s favor: Labour’s entire party manifesto leaked to newspapers. It contained Corbyn’s entire program to crank up spending and raise taxes. The popular press tore it to pieces. The idea of the avuncular Corbyn as a potential leader was a joke that even May would laugh at during her stump speeches. But his policies were suddenly being discussed. Plans for pumping money into schools and nationalizing rail transport captured the public imagination after years of grinding austerity. May’s Tories, meantime, were drafting their own manifesto under the leadership of her co-chief of staff, Nick Timothy, and Cabinet Office Minister Ben Gummer. It was these two men who got the blame for the Conservatives’ controversial policy, announced on May 18, that would have required seniors needing help with daily care to pay out of pocket until they ran down their assets, including housing, to the value of £100,000 ($127,000). The outcry was immediate against what came to be known as the dementia tax. After just four days, a rattled prime minister ditched the policy and pledged to cap the total amount that anyone will be forced to pay for care in old age. “It was something that really hit home and was a serious problem,” Graham Brady, a senior Tory lawmaker, told the BBC on Friday. Some campaign officials said the manifesto wasn’t discussed outside May’s inner circle of Gummer, Timothy and Fiona Hill, her other chief of staff. When these aides presented it in the form of a published book to the Cabinet, it was too late for the care policy to be changed even though its dangers were obvious, according to people familiar with the internal debate. Just at this moment of crisis, a terrorist suicide bombing at a pop concert in Manchester halted the entire campaign. The care debate vanished as troops were deployed on the streets to tackle the terrorism threat. 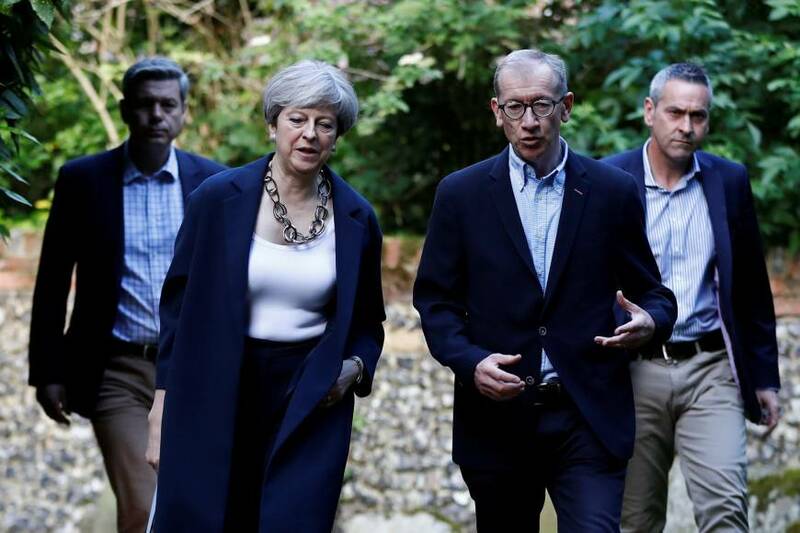 A few days later, on May 25, the premier was in midair, flying from the NATO summit in Brussels to the Group of Seven gathering in Sicily, when a YouGov poll in The Times of London gave the first sign of a collapse in her support. The Tory lead was down to just 5 points from 20. Less than two weeks after the Manchester bombing came a second attack. Three terrorists murdered eight people and wounded almost 50 more in a knife and van attack on London Bridge and at Borough Market, before they were shot dead by police. Now, security, not Brexit, dominated. 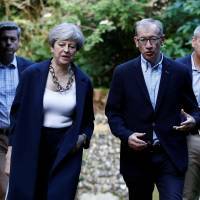 May and her team warned that Corbyn had a track record of giving cover to terrorists and calling banned groups — like the Irish Republican Army and Hamas — his “friends.” But Tories feared their government was being blamed. May’s ally, Donald Trump, didn’t help when he lit into London’s Muslim mayor, Sadiq Khan, on Twitter. Still, as voters went to the polls on Thursday, May’s campaign officials in their central London headquarters remained sure they’d win comfortably. At 10 p.m., when voting ended, broadcasters flashed the results of an exit poll based on how 30,000 people had voted during the day. At Tory headquarters, it was as if all the air had been sucked out of the room, two of those present recalled. Nobody spoke. No one moved. Then, party pollsters began to test whether the broadcasters could be mistaken. They weren’t. As the night wore on, Tory staffers on the fourth floor of the party’s offices at 4 Matthew Parker St. snacked on supermarket quiche and drowned their sorrows in bottles of beer, and white and rose wine. Someone produced a bottle of sherry and another colleague opened some whisky as the dismal results flashed on television screens. By the time May arrived in the gray light of dawn from her district west of London, she and her team all knew that the broadcasters’ predictions were horribly accurate. As she tried to reassure party workers, several of those watching thought she was going to resign. She didn’t.